Vendor Conditioning - how real is it and what does it mean? I have been delighted by the response to the series of articles I wrote detailing the personal process of selling our house. I have now edited the individual articles into an e-book which is available to download for free, so hopefully people can read and share freely. It has been interesting to hear comments people have made to the articles. It is very interesting to me to hear these comments realise that a lot of people did not have a clear idea as to the many parts of the process. Naturally not all comments have been enthusiastically supportive. This does not surprise me, and to be honest I am always glad to have challenging comments raised. The debate and interchange is a vital part of the exercise, I think it adds hugely to the overall value of articles as a validation process. One particular commenter of the final article was forthright, he challenged me to the extent of believing I was gullible and should not have been so naive. He described a part of the process, which he referred to as vendor conditioning. The process whereby agents “manage” the vendor expectation so as to ensure that the agents objective of a sale are achieved irrespective of the outcome for the vendor. In effect fundamentally challenging the very principle that the agent is working for the best outcome of the vendor. I know it is subtle, but it is an important distinction. He stated that in our case when our agent provided what I judged to be incredibly valuable insight into the prospective buyers, our agent was in reality manipulating the facts, he was, he proposed choosing to be selective in the feedback he gave us - choosing to only share with us the buyer feedback that downplayed the value expectation and thereby kept from us the more aspirational feedback which might have indicated that our property was worth more than he as the agent had originally indicated. The logic he put forward was to ensure that we set a lower reserve at the auction, so that firstly the property would sell ‘under the hammer’ and secondly that the sale price would be above this ‘conditioned’ expectation and therefore he, the agent would look to have over delivered. This is a very interesting comment and supposition. I can clearly see the potential for this to happen and in fact I can find no way of refuting it as a generalised rule. I can however categorically state that in our situation the original assessment we had made of the market value of our property baed on my knowledge and experience even before we engaged with the agent was very close to the final sale price we achieved. Further the final sale price was at a level that I would describe as “a very nice price”, as opposed to at one extreme “OK” and at the other extreme “highly delighted”. So whilst I would defend my comments and defend our chosen agent and state that we were not the victims of vendor conditioning, I am left with a view that this is a real possibility. It therefore leads one to ask the question - how do you establish objectivity in the process of selling your house, and thereby avoid conditioning? The simplest answer is to get a professional independent valuation of your property before you engage an agent. I personally think that too much of the focus of the engagement of an agent is based on the ‘appraisal’ of the property. That too often, the choice of agent is based on the agent who provides the highest appraisal. This is so wrong. The real danger in choosing the agent with the highest appraisal is that they might well be appraising a higher valuation simply to “win the listing”. The hard truth is that no matter what any agent thinks your house is worth you will only get for it on the day of sale what someone is prepared to pay for it. The agent is there certainly to maximise the price, however that skill is not related to their skills as an appraiser so the choice of agent should be the one who is the most consummate at negotiating, the best at marketing and the best at facilitating the buyers to ensure the property generates the maximum number of prospective buyers. I have to declare a bias here and be upfront. I am not a fan of property schemes; training courses that perpetuate the idea that property is the answer to a financially secure future, a way to make a million or any other scheme that whilst trying to sell a money making venture that is really just trying to ‘sell’ a property. Let’s face it property developers are not interested in your retirement or mine for that matter, nor are the agents who act for them. I say that not to demean them. It is just that the marketing tactics that they employ, to my way of thinking are not much better than those of a snake oil salesperson. Sadly we all became far too aware of such schemes in the last decade as we saw the collapse of the high profile finance companies and I would have hoped that we could have learnt from that period and tried to approach these property developments in a more transparent and professional manner this time around as our major city seeks to expand upwards and create apartment living in every corner. So with this inherent bias I was flabbergasted by an advert in the Weekend Herald last week. Leaping out from the small advert was a picture of Albert Einstein - one of the luminaries of modern times - what could he be doing involved in selling real estate I thought to myself? The details as I was about to lean were buried in the advert - when you got to read it. And here is where we come to the complaints I have for this advert. There are 3 major complaints and they are in some ways serious enough for a formal complaint to be made to the Real Estate Agents Authority and/or the Advertising Standards Authority. The audacity of the advertiser to try and squeeze all the regulatory small print into that tiny advert. Albert Einstein is somewhat of an iconic individual of the 20th Century receiving as he did the Nobel Prize for Physics in 1921. He is best known for his mass-energy equivalence E=mc2. What then is his likeness doing on a real estate advert? The advert purports that Einstein had a Rule of 72 - this is not factual and irrespective of that the Rule of 72 speaks to a shorthand way of assessing the time period required to double the value of a capital sum based on a simple interest rate. If you divide 72 by the interest rate (say 10%) then in this example you get a figure of 7.2 - which is the number of years required for a capital sum to double in value if the interest rate payable is 10% based on compound interest. The reality is that the statement in the advert that “in future years the property should be worth more, much more” is neither attributable to Einstein nor to the Rule of 72. Lastly GreenLight, is the duly appointed exclusive licensing agent for the Hebrew University of Jerusalem, who hold the rights to all likenesses in any form of Albert Einstein and it is also authorized to vigorously pursue all unauthorised uses of Albert Einstein's creations, appellations, copyrights, right of publicity, photographs, trademarks and characterisations, and to prosecute and maintain trademark and copyright registrations on behalf of The Hebrew University of Jerusalem. So I would be very cautious about using any unauthorised images of anyone on any advert. The advert is full of speculative assertions "A city residence can now be purchased with only $1,000 down and nothing to pay for 14 months" and similarly "After finance charges, you can have other people paying it off for you". Nowhere does it say which property and where and for how much and what type of property you might get. Nor as to the risks of buying an apartment and the potential issue of arranging finance or the problems of tenancy. No it sells the snake oil of "make a few hundred dollars a week coming in as extra income in retirement" and of course the presumption of a "long term appreciating asset"
Disclaimer: Only available when purchasing an off the plan Urba or Queens Residences apartment and only apply where the Vendor accepts a Purchaser’s request for payment of the balance of the deposit (usually 10% of the purchase price) to be deferred until settlement, and the Purchaser enters into a Deferred Deposit Deed with the Vendor (if acceptance with clause 23 of the Agreement for Sale and Purchase) within 15 working days of signing the Agreement. At settlement the balance of the deposit together with the full purchase price must be paid. If the Vendor does not accept the Purchaser’s request for payment of the balance of the deposit to be deferred until settlement or, if the Purchaser elects to pay the balance of the despot by cash, the full deposit must be paid in cash in accordance with the terms of the Agreement. Capital and (not legible) values rise and fall according to market conditions, investing in property is a long term investment, not a get rich quick scheme for spectators. The information contained herein is not financial advice and should not be relied upon as such. Prior to signing any legal documents, such as contracts, you should seek independent advice. Every Precaution has been taken to establish the accuracy of the material herein at the time of printing, however no responsibility will be taken for any errors or omissions. In my view this advert does nothing for the professionalism of the real estate industry nor does it add any value to the properties that are endeavouring to be marketed or the agent acting as a sellers agent. It's shoddy and if I had the time I would like to take a complaint against the advertiser for the latter of the 3 issues at least - time will tell if they receive a complaint and financial penalty against the first issue! 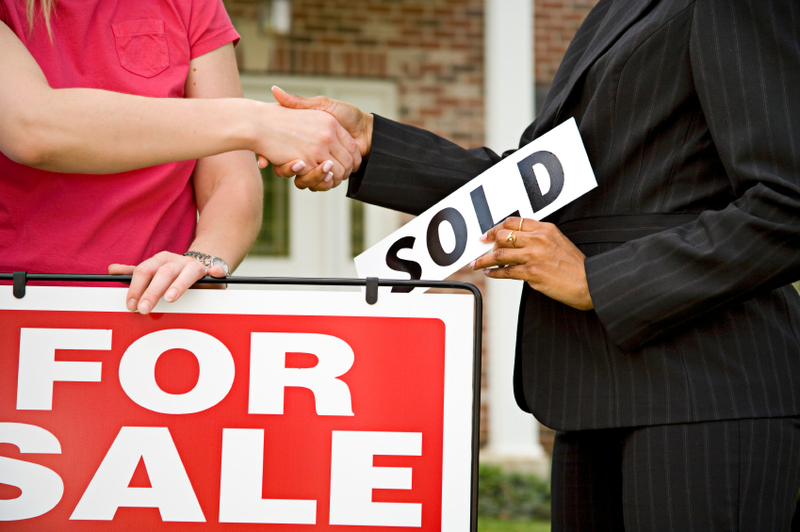 Selling your home - a personal perspective: 4 - The Sale! Would the prospective bidders our agent had identified be there? Would there be sufficient interest to generate a bidding war? Would bidding exceed our reserve? These are the common questions asked by anyone about to sell their house by auction or in fact almost any forms of sale. But before detailing the outcome of the sale let me recap. As chronicled in prior articles I have over a series of 4 posts detailed the processes and decisions we had gone through in identifying the method of sale, choosing the agent and establishing the marketing plan for our house. Overall a carefully planned programme designed to ensure that our property was presented to potential buyers in the most appealing manner to generate interest and stimulate demand, and ultimately sell our home. One aspect of the whole process that most impressed me and strangely (given my experience in the industry) surprised and delighted me, was the very detailed and intimate understanding we gained through our agent as to the prospective buyers. I do not know if this degree of detail is common practice but as a seller it was vital to a sense of connection to the process. At each meeting with Blair in de-briefing the weekly open homes as well as interim meetings and chats, he shared insights and feedback on each of the key prospects he had identified from enquiry and open home visits. He referred to these prospective buyers by name. He provided insight as to their personal situation, where they lived, what they were looking for, what their expectations of price were and what aspects of the house they most liked and disliked. Over the 3 weeks of the campaign leading up to the auction we saw insight into a total of 5 couples. The insight was not intrusive nor in any way a breach of privacy or personal confidences, but provided us with a great ability to manage our expectation and in so doing I believe added credibility and professionalism to the role Blair played. As I say, if this is common amongst agents then these smart agents in my view do themselves a disservice in not highlighting this value they bring to the process. In my opinion it is vital and truly valuable part of the real estate process. Through the 3 weeks of the campaign we had what amounted to a virtual leaderboard ranking of prospective buyers with some surprising movements. Barely 7 days into the campaign we had what both Blair and ourselves though were the perfect couple as buyers. Cashed up from selling a property in the South Island and frustrated at living in rented accommodation, this couple ‘fell in love with our house’. They visited a couple of times and Blair talked to them about making a pre-auction offer of which they were engaged around the idea. We even were able to verify their seriousness as we witnessed them bidding at an on-site auction at another very similar property in the neighbourhood. Then things went quiet with them for 5 days only to discover that in those intervening days they had not only found another very different style of property, but had actually attended and bought it at auction! It just goes to show how little you can tell of people’s real interest or intent. We heading into the last 7 days leading up to the auction with what Blair believed were two strong potential buyers. The property ticked all the boxes for them and they had both seen the house a couple of times. They appeared to have done their due diligence. Based on this and the belief that you have to take the market for what it is, we sat down with Blair coming up to the final weekend of open homes. Our question was ‘why do we need to do these final weekend open home viewings?’ - it seemed to make no sense, who would suddenly appear out of left-field 3 days before the auction? Blair convinced us against our better judgement to go ahead, so dutifully we tidied up and prepped the house again for what we thought would be a quiet viewing. How wrong could we have been. A new buyer appeared, or at least a relative of a prospective buyer. They loved the house and wanted their relatives to view the house when they came up to Auckland on the Tuesday (the day before the auction) - not a problem we thought, can’t do any harm. Little did we know that this prospective buyer would go on to buy the property! A key step before the auction was the setting of the reserve with Blair. Naturally we had developed our own view of the expectation of price and what we would be prepared to accept. As a point of note I choose not to reveal the reserve or the selling price - this is not the essence of this article. This is a matter we as sellers choose to remain confidential. The reserve we agreed on was surprisingly aligned with Blair's recommendation, or maybe it is not surprising as through the 3 week campaign he had provided a clear view of the expectations of the prospective buyers, accepting as always that buyers never want to truly show their hand when it comes to price. The reserve price was set at a level at which we would be satisfied. Like all sellers we would wish to be blown away by frenzied, manic bidding with a stunning resultant price, way above the reserve but you have to be realistic. At the end of the day the difference between our reserve and Blair’s recommendation was less than 5% - naturally we were higher! An unusual set of circumstances arose in relation to the actual auction day and time which meant that my wife could not attend. This troubled us as to how we would cope if we could not both be there as joint owners of the house. Our immediate thought was how to facilitate the signing of the Sale and Purchase Agreement - would we have to get a power of attorney for me to sign for both of us? Again this is where you can be surprised about how little you know of the process. In an auction you as the sellers completely sign over the sale to the auctioneer who through a right of representation acts legally on your behalf to transact the sale at a price at or above the reserve. This document was signed the day before the auction effectively leaving us both out of the process. This is a very interesting situation and something I sought advice on from an independent and experienced agent. His advice (somewhat surprising) was that you as sellers should not attend the auction! The logic being that in this way you insulate yourself and thereby avoid the pressure coming from the auctioneer and agent trying to encourage you to compromise on the reserve if the bidding fails to reach reserve. This is a very interesting strategy and something I had never considered. If the role of the auctioneer is to sell the property at or above the reserve and this is your wish then not being present has its merits (and some degree of risk as I am sure many agents will tell you). Blair had told me in a pre-meeting that he knew that there were definitely two serious buyers in the room. I won't take you through the chapter and verse of the actual auction suffice to say that the auction lasted 5 minutes and 24 seconds - I know that because I recorded it on my iPhone - captured for posterity! There was as anticipated, two genuine bidders. Once of the bidders clearly had a threshold which he stuck to staunchly despite the best skills of the auctioneer. The property reached a final bid which was just below the reserve. So with a pause in proceedings, the auctioneer began a somewhat lengthy and protracted process of negotiation with the highest bidder with a clear instruction staunchly adhered to from me that the reserve was fixed and not up for negotiation. The end result was that the auction was recommenced and called and the property sold "under the hammer!" In my opinion the outcomes was a satisfactory conclusion, whereby as I have often said the price expectations of us as sellers was met by the preparedness of the buyers to pay that price - I felt that the outcome was fair and open; and neither party should have any reason to feel aggrieved nor triumphant. So after a number of weeks of tense anticipation and nervous expectation we sat back at a well deserve celebratory dinner (actually pizza and a beer at 4 in the afternoon!) and reflected over the process. We had in our hand a signed unconditional agreement for the sale of the our house, with the deposit already transferred from the buyer to the agency rust account; thereby allowing us to move on with our lives and to close a chapter on both the ownership of this house and the selling process. When it came to reflecting on the cost / benefit analysis of the process we did not (as is universally accepted in the process) physically write a cheque for the commission fees paid to the agency company. We did not feel the ‘pain’ of that large amount of money leaving our bank account, it was seamlessly deducted from the balance of the deposit paid by the buyers. However, we have reflected often on our decisions and the process, and we do not in any way begrudge the fee we paid for the services provided by Blair. We felt that we were professionally guided through the process without undue stress. We discovered great insight from the process and were delighted with the outcome. That chapter of our lives is over and a new chapter begins. By the way - this is not our new house or our old house - just a nice pic of a house! Recently we have completed a complex, emotionally charged, time consuming and potentially life-changing process - we have moved house! Much like 80,000 other people this year, we have sold our existing house and bought a new house to call our home. However unlike the vast majority of these other buyers and sellers I have an insight and knowledge of the industry, and the property market that gives me somewhat of a unique perspective of the process. A process I am keen to share, providing some observations and insight, now that we have successfully completed the move. I decided to wait until we had finally completed the process before writing what I intend to be 4 separate articles which break the process down into what I see as critical components (i) the decision around the method of sale - agent or private sale, then (ii) choosing an agent (iii) the marketing and finally (iv) the completed sale. I will be completely up-front at the start and declare that the process was highly satisfactory. Not only that, but the experience has, I am pleased to report (and to the pleasure I am sure of 10,000+ real estate agents) significantly changed my views, presumptions and appreciation of real estate agents. In selling our house we followed a path trodden by over 90% of people selling their home. We appointed a licensed real estate agent, who marketed the home and undertook to facilitate the process with consummate professionalism and delivered for us a result which met our expectation. We paid a market rate commission which in the cold light of day is a large amount of money, however whichever way I look at it, the outcome is the most important thing - we sold our house without undue stress. We were therefore able to move on to our new home in a timely manner and naturally get on with our lives. Deciding to move house is not something that comes to you in the middle of the night as a bolt from the blue and drives you to call up a local agent the very next morning. Like most people we began thinking about moving around 8 months before we actually put the house on the market. I suspect that this time period, whilst a long time in absolute terms is neither uncommon, nor unrealistic. We wanted to ensure our house was in top condition before we started marketing it and we knew there was some work to be done, added to which we wanted time to check out the options for a new location and a new house. With the house completed to our satisfaction earlier this year, we looked at the various options to the process of selling the house. In my mind, and with my experience, there were three valid options which I wanted to sit down and seriously consider with my partner. 1. We could undertake the whole process ourselves as a private sale or as the American’s love to call it a FSBO (For Sale By Owner). The attraction of FSBO is saving money. In NZ that saving of the fees of a licensed real estate agents run into the tens of thousands of dollars. This is a sum worthy of serious consideration. 2. We could experiment with a new model of real estate - using a licensed real estate for a fixed fee and a undertaking some of the work ourselves. This model lead by the innovative service of 200Square certainly appealed to me. 3. We could appoint a local licensed real estate agent. Make them accountable for the outcome of a successful sale and pay them a commission fee at a market rate. Irrespective of which of these 3 options we chose, I knew for certain that there were two elements of the process that were not negotiable - we would use a professional photographer and we would market exclusively online. A professional photographer would be engaged to undertake a complete photo portfolio of the property together with a set of floor plans - an absolute must in my opinion. When it comes to online marketing the listing on Trade Me Property was a must, together with premium featuring to ensure we stood out from amongst the other properties on the market. If we went with a licensed agent then coverage online would include Realestate.co.nz as a complementary platform. So the first issue in preparing to put our house on the market was which of these three options we would choose. Selling privately naturally has a significant attraction in financial terms, this coupled with its ability, through the use of Trade Me Property and a professional photographer to achieve exactly the same level of market impact, viewing and potential open home traffic as any licensed real estate agent, makes it a serious consideration for many. However the fact is that marketing your home and selling your home are as separate as buying the ingredients and serving a gourmet meal. There is so much more to the process required to bring people to the point of being able to make a decisions which eventuates in a sale and purchase contract being signed is subtle, hidden and challenging for the average person. I have gained an insight into this extensive process over the years I have worked with real estate and I can see just how complex and under-appreciated is the process of hand-holding that is required to get people to make a serious move to buying a property. It takes a certain type of personality to be at the same time persistent, forceful, cajoling, pleasant, empathetic and ultimately results-driven to get a successful sale. We can all identify a real estate agent. They stand out from the crowd. It is that personality type that makes them effective at what they do and the rest of us, pretty poor at trying to do their job! So having decided not to go for a private sale, the simple question then was, the traditional model of real estate agent or the new innovative model? Stacking up the similarities and differences only makes the decision that much harder. Traditional agents and innovative real estate companies such as 200Square both operate under the laws of the Real Estate Agents Act. Both services would be handled end-to-end by professional agents with many years of experience and success behind them. Both would be able to market the property as well as each other. Both would work to succeed and earn a fee / commission on successful sale. The only difference is really that 200Square does not physically meet you at your house, they do not have a high street office in your suburb (not that makes any difference), they do not manage the open homes; they judge that is something you can do just as well or better, and if you want someone to do it for you then can arrange it. What they do better than any traditional agency is an online dashboard putting you in the driving seat as to the progress with the sale of your house, not only the data of online viewings but an insight into the lead management and the negotiation process. Most striking of all though is the fact that they do not charge a commission based on a percentage of the selling price which for most agents amounts to around 3% plus GST. 200Square charges $4,500 - a flat fee irrespective of the value of your property. That comparison creates a tough challenge. 200Square has a good track record, they have been operating for over 3 years and have sold many more houses in that time than the local real estate agent, right across the country - can’t be bad. However at the end of the day when we as a couple sat down and weighed up the decision it came down to one factor. When my wife asked me - putting aside the costs, could I in all good consciousness tell her that there wasn't any risk in using 200Square? - I could not. Not that there is any risk at all, they are a licensed real estate agent. The issue comes down to trust and like it or not - local agents sell local houses and in our area; nobody has used 200Square in our area and therefore that presents a risk. A risk which when it comes to selling your home becomes far more amplified than for many other decision. The one thing which in my mind is bigger than anything else in the process of selling a property is reducing risk. That is it; and to be honest the cost of reducing that risk can be pretty high, but it is easy to justify it at the end of the day. Real estate industry abandons print media! OK - this headline is not quite true. But I couldn't help myself to take the opportunity to headline an article that I never foresee occurring, a least not anytime soon. The news is that the Real Estate Agents Authority (REAA) the body that has under the mandate of the Real Estate Agents Act (2008) undertakes the licensing of the industry has after 4 years in existence decided (very smartly in my view) that there is no logic in requiring that prospective agents advertise as a Public Notice their intention to seek registration as a licensed real estate agent in local newspapers. Instead they are offering the facility on their own website. This is completely logical as their website also hosts a directory of all licensed agents in the country. It always seemed somewhat illogical to me at the time to seek to make a public notice in a newspaper as a means to challenge people's right to oppose applications to be an agent. At the time I offered for Realestate.co.nz to host such notices given the contextual audience. The move will also no doubt please prospective agents who in addition to the costs of the course and the license application (c.$3,000+ in total) were required to spend what in the case of Auckland was around $500 on 2 adverts which I would challenge anyone to say they had ever read. The losers will be the print media companies who will face an estimated loss of c. $100,000 of advertising revenue per annum - so continues a steady and pervasive decline, however those media companies can still count on the more than $75,000,000 of spend the real estate industry overall will spend this year on print media. A sum that seems slow to transition to digital and thereby pushes further out my long awaited headline of "The Real Estate Industry abandons print media!" Trade Me Property changes its pricing model - again! Trade Me Property today announced a new pricing structure almost a year after the implementation of the radical switch from a subscription model to a pay-per-listing business model. That model has, so it seems, proved to be a too great a stretch for the industry to accept and likely as not, too troublesome an issue for Trade Me to continue to deal with as it approaches it annual reporting just 3 weeks away. The new pricing structure is on the face of it, a significant win for the real estate industry as it re-establishes the subscription model, whilst at the same time offering a scaled per-listing fee and a regionalisation of pricing. The real estate industry mobilised itself into action upon the announcement of the new pricing model last November with clear messages passed within the industry from, at the extreme a complete boycott of Trade Me Property, to merely advising clients that the website had changed its pricing and was no longer a mandatory component of marketing of a listing. At the same time the industry circled the wagons around the ‘industry-owned’ website of Realestate.co.nz as a means to provide the home-shopping public with an alternative to Trade Me Property. As the standoff ensued over the next 10 months there has been a clear demonstration that the impact on Trade Me’s business was being felt in both customer loyalty as demonstrated by listing numbers and in investor confidence as evidenced by the share price (although it is not accurate to entirely correlate share price to the issues with the Property sector, however it is a critical sector). It is my belief that this new pricing scheme will in one fell swoop patch up the issues that Trade Me Property has faced, resulting in a solid re-population of the site to full strength and full loyalty (and if not loyalty then at least patronage). It will not deliver the much hoped for absolute gain to the bottom line that the original pricing model of a pure per-listing fee would have delivered but it will get the company back on track to build its business for the future. So what are the details of the new price structure, who will benefit, who will choose which of the options and what will be the medium term outcome, as well as an assessment of the winners and losers within this tussle? The new subscription service with unlimited listings will be open to all offices with a regional split with metro offices in Auckland / Wellington / Christchurch paying $1,399 per month, an increase from the previous monthly subscription from last year when fee was $999. For those offices outside of these 3 metro areas the monthly fee will be $999 - no change. This subscription model based on location is a smart move in that it moves the company away from a single flat fee structure, to regional pricing. This will go down well with provincial customers who have long fought to be recognised as having a wholly different cost base than the metro real estate operators. Once established, Trade Me Property may well apply this regional structure to their premium property advertising and also potentially further segment by geography as I am sure Southlanders will likely argue that Hamilton and Tauranga should pay more than them or rather that they should pay less. Regional pricing makes sense and it will be interesting to see if Realestate.co.nz follow suit. Trade Me Property will continue with the per listing fees in what they describe as the "Flexi option" however to mirror the differential pricing that was introduced for private sellers a year or so ago, single listings will be $159 for a property with a rateable value over $450,000 and $99 for those under $450,000. This will also go down well especially with the smaller offices. On top of this they are making a very public statement that the scale of a customers business affords discounts in the form of Gold / Silver / Bronze. The average office in NZ is actually quite small handling around 100 listings a year / 8 listings a month, with many of these offices in provincial areas of the country where the median listing is more likely $300,000 this change will be welcome news. A year ago these offices would have been paying $999 a month for unlimited listings. The per listing fees bumped this up to $1,272 whilst this new structure will cost them $800 - a win! The retention of the listing fee based model is in Trade Me’s words a method whereby offices can seek to remove the sunk cost of Trade Me Property and appropriately pass the cost on to the consumer, in effect saving them thousands of dollars a year. Time will tell if this is how the industry see it. So overall the industry will feel I think, vindicated in leveraging their collective muscle against Trade Me and maybe Simon Tremain of Tremain Real Estate in the Hawkes Bay and Tim Mordaunt of Property Brokers in the Manawatu and Hawkes Bay will be hailed as heroes for staunchly refusing to capitulate and effectively completely boycotting Trade Me Property for all this time across all their offices. I think it is likely that the vast majority of offices will switch back to a subscription model, the metro offices absorbing the higher monthly fee and relinquishing the charging of the fees to vendors. Many small offices will choose the per listing fee not to pass the cost on, simply as a means of saving money. So the question has to be asked - so who’s the winner and who’s the looser in this change? For my money the short term winner is the real estate industry. They will be happy and as I say feel vindicated. In the medium and longer term Trade Me Property is the winner. They will once again re-affirm their dominance of the lead generation business for agents from the largest and most comprehensive portal of listings covering licensed agent listings and private sellers. They will now, once they have regained patronage (if not as yet loyalty) build a growing business in premium services sold more aggressively through a growing field-based sales team. They will naturally hike fees regularly and in time seek to move to a pure per listing fee, probably as a more bundled offerings as other leading portals do. This will deliver the bottom line that the company and the investors want. As for Realestate.co.nz I fear that they will be the loser in the short and long term. They have emerged from this period a lot stronger in audience terms and with a greater industry appreciation, however with Trade Me Property back with a full listings complement the delivery of leads through Trade Me will return and Realestate.co.nz will be back to being judged by the industry as a championing industry site, yet hardly a comparable adversary. Compounding their problems will be a more aggressive and significantly larger resource base across the Trade Me Property sales team out in the field who will seek to develop a stronger relationship with agents and offices matched to a significant ramping up in their technology team. Disclosure: I was CEO of Realestate.co.nz from 2006 to 2012. I provide consultancy services to Trade Me Property from time to time, but I note those services do not extend to advice on pricing and offers. All insight and opinion expressed here are without any reference to any knowledge or insight I have gained through my work at Trade Me Property. I read this short but interesting article from Inman News over the weekend titled "Appealing to millennial homebuyers often requires out of the box thinking"
It got me thinking about the way real estate is and has (or has not) adapted to the changes in the demographics and attitudes of the new generations and the cultural changes of the past 20 years. Not exclusively the domain of millennials but for most of us these days buying any product or service involves at some stage an online search. Whether for price comparison, product details, customer feedback or just simply opening hours. For real estate this is a telling fact. Real estate is a business providing a service to homeowners wishing to sell property. These home sellers don't want to be prospected by real estate agents. They want to do their own prospecting to find an agent that suits their needs. As the article says (and here again I don't think this is the exclusive domain of millennials) people tend to be resistant to strong sales technique. We have been empowered through the resources and capability of the internet and more than ever shun hard selling technique. Hard as it may be to hear this, real estate agents need to change their approach to securing new business and stop prospecting using hard sell techniques - they need to nurture relationships - not sales leads. Be part of the community really resonates with me. However I think most real estate companies and agents think this means a flash new office on the high street. I have noticed over the past 5 years the look and feel of real estate offices have changed markedly. Gone are the windows plastered with pictures of properties for sale, replaced by inviting open spaces with comfy chairs and coffee machines that look very inviting. However when was the last time you saw anyone sitting in one of these goldfish bowls? To be a part of the community means so much more. Banks have learnt so much more about this in their local business centres - places where people can use offices and Wi-Fi to sit down between meetings or host meetings. How about real estate offices taking this idea from banks for business people and doing the same for non-business people? I am not exclusively thinking of young mothers, but imagine a place to have a sit down - the role libraries used to provide (and still do) where you could grab a coffee or a water, use Wi-Fi have a chat with a friend, hold a community meeting or whatever. A place in the community - a part of the community. Giving back to the community. Real estate is well respected as a large donor to charitable organisations - think Ray White and Ronald McDonald House, Bayleys Guide Dogs and Barfoot & Thompson Starship. Very laudable and public spirited. However real estate is essentially a hyper local business. People engage local agents and the colour of their jacket, tie or the brand logo on their business card is largely a supportive component of the decision. Real estate agents do foster and hold deep relationships into the community and they do sponsor local school events and rotary clubs. However the Inman article about supporting local artists somehow struck me as more mutually beneficial than simply giving money to a cause. How could real estate agents work more with local businesses to see more mutual benefit? I don't have the solution, I just wanted to trigger some thinking - any ideas? The fact is we are not the same people we were in the 80's or 90's - the home buyers and sellers in the next 10 years have no idea what a cassette is. To them the stock market crash happened in 2008, not 1987; they cannot imagine interest rates of 10% let alone 20% and can't conceive of a house not connected to ultra high speed broadband. However the large majority of real estate agents were in school or had started work when man took its first tentative steps on the moon and most probably know the words to or can hum along to American Pie! A few weeks ago I posed the question in an article as to “Just how competitive is real estate in NZ” - citing the factual comparative advertising shown in the UK. At the time I suggested that factual comparative advertising was not regarded as appropriate in NZ within the industry. Well I was wrong. What is more, I have found it alive and well right on my doorstep in my local community newspaper in Devonport, the suburb in which I live. The local comment newspaper “The Flagstaff” is a great collection of news, letters, profiles and historical insights, very conspicuously supported by the real estate industry in the community - 1 in 5 of the pages is a real estate advert for an agent or a listing. Not unusual, as I am sure such local community papers exist around the country and are widely patronised by agents to reach out to the community. This week's paper had two full page adverts from individual agents both of which typify the traditional approach taken by agents to promote themselves. One approached the advert in a traditional manner - full photo and a biography of past achievements and involvement in the community, talking of "bringing energy and confidence to the real estate process", of "real estate expertise and real world experience and success through hard work" - all laudable attributes of an agent. The other chose to let her clients speak for her with a glowing testimonial, extolling her capabilities and commitment to go the extra mile and her passion and positivity. Oddly given the industry’s love for profile pictures I was surprised that this advert does not have the ubiquitous agent photo and personal contact number - merely the office details. Both of these adverts are what I am sure we are all accustomed to and would be likely replicated around the country by many hundreds of agents each week. There is no implied criticism in these adverts, they serve a purpose in raising the respective agents profile. However turn the page in this community magazine and I was surprised by this advert. This advert is direct, factual, compelling and has an arresting capability to attract attention and get people talking. This agent makes a statement of performance that leaves the other agents struggling to catch their breath. In past 2 years in the suburb of Devonport this agent is responsible for selling 46% - virtually half of all the properties sold in the suburb for over $2 million. That is 23 sales out of 49 in the past 2 years and this is by one agent. There are, as she states 42 agents in Devonport - she is one of them and she alone accounts for close to half of all sales above $2m. The suburb has a median price of around $1m - Wow! You have to say, if you owned a $2m house in Devonport you would have to think twice about why you would not use her or at least get her to pitch for the business. This is without doubt smart advertising. Its factual. It is absolutely relevant and clearly it is true and it blows out of the water the subjective differentiation other agents seek to establish around ‘pillars of the community’ and working ‘that bit harder’ - after all what counts is results. Maybe what the real estate industry needs is to expose more of the facts and let people choose agents based on their performance and let their performance track-record speak for itself. Just how competitive is real estate in NZ? On the face of it the NZ real estate industry is incredibly competitive. There are over 10,000 licensed agents all fighting for just 76,000 property sales a year. That’s barely one sale per agent every 6 weeks of work, one income bearing sale - lean pickings indeed! Some might argue that there are too many agents fighting for a slice of the real estate cake. That might well be true, but on the face of it, it certainly looks to be a highly competitive industry. Further to support this belief is the extent of marketing undertaken by individual agents eager to secure your business, all showcasing their skills and experience. The differentiation of one real estate agent to another, or one real estate company to another in NZ is paper thin - they all have a list of glowing referrals as long as your arm and offer "Free Appraisals" as if this was a compelling point of difference. However when was the last time you saw a NZ real estate company undertake this type of advertising? I am grateful to Robert Brown who snapped this photo from a train in Kent, England. You wouldn't take a slow train, so why us a slow agent? "Strutt & Parker sells houses faster than any other agent in Sevenoaks. And Whether in town or country, we achieve on average, 99% of the guide price". Now that kind of messaging in advertising certainly gets me interested. To have this type of insight and performance metrics to guide my decision as to which agent to use would be far more powerful from endless testimonials that all praise the agents to the skies. The problem with testimonials is that they are curated. When was the last time a testimonial expresses anything but glowing endorsement? In today’s world negative reviews as part of an open dialogue of customer feedback is far from being viewed as the death-knell of a business, far from it as the honest balanced feedback is judged positively. Having rich comparative data on agent performance would be a great competitive advantage for any real estate company or individual agent. A NZ real estate company that could deliver this performance as demonstrated by Strutt & Parker would not only be able to gain new customers, it could also attract the best agents. Such competition would certainly force other real estate companies to seek to better understand why their performance lagged behind the leader. This would engender competition in the industry. Drive efficiency and enhanced customer satisfaction. Whilst I am sure there will be detractors to this article and this fundamental question, there is no denying the fact that real estate has metrics. Be it the days-on-market, the asking price to sales price ratio, the marketing investment vs return, or the market share of a real estate company (there is one company for which such data exists - Barfoot & Thompson). The key question is, do real estate companies hold themselves accountable to these metrics, do they want to from a public accountability perspective? Ensure that all advertising and marketing materials and conduct of the Agency Member and their employees is a fair representation of all relevant facts, and therefore not in breach of any relevant statutory requirement (such as the Fair Trading Act 1986 and the Commerce Act 1986). Ensure advertising and marketing content does not denigrate other competitors or the wider real estate profession or practitioners. The second paragraph is the key as the industry interprets this (or has agreed to interpret this -based on conversations I have had within the industry) as companies and agents should not use data from the Real Estate Institute published sales data to undertake comparative advertising which would "denigrate other competitors". We live in a digital world, one in which we can evaluate our tradespeople, our local cafe and every product we want to buy. We can use the collected wisdom of the global community to guide our decisions, so why is it that the decision to seek to find a professional to facilitate the largest transaction of our lives cannot be better informed through access to performance data? This is not to say that the decision of the choice or agent or real estate company should be a purely objective decision, the feel and fit of the right agent is also key as are referrals but a third leg to the decision stool adds stability and surety to the decision. Do agents warrant such front page public censure? Real estate agents rely on their reputation, as there is very little else to differentiate the services of one agent to another or one real estate company to another, and in this world where the right to be forgotten is wholly unworkable the real estate agent involved in this matter is likely to suffer significantly greater loss than the $2,000 he was fined by the Real Estate Agents Authority. I have faith and belief in the role and effectiveness of the Real Estate Agents Authority as clearly, through their complaints procedure they have found the licensee agent and the company guilty and certainly the complainant did have due cause to complain. My concern though is with the reporting of this case in the media which I think does not in anyway match the scale of the complaint. The readership of the Herald on Sunday as the newspaper publisher so glowingly highlighted the other day is 371,000, add to that an even larger audience online and the fact that this article is already the most read article of the day; and I would judge that this is effectively a public flogging and humiliation of an agent far more severe than is fairly justified. Lets examine the facts which I have done so that transparency can aide an objective evaluation. (The full details of the decision by the Complaints Assessment Committee can be read here). Firstly this headline and front page article is not actually news. The auction to which the complaint relates was held in March 2012, the complaint was heard and adjudicated upon on the 29th November 2013 and the fine was imposed on the 6th March. The article is published here on the 1st June 2014. So the newspaper has been sitting on this article in reserve for 3 months waiting for a quiet-news-day when they could roll this out in an attempt to fill a void as there is nothing remotely newsworthy (in the context of current) about this - it was news on the 6th March. The Complainant signed a listing authority which featured an onsite auction with the preferred auctioneer in December 2011, however that authority was cancelled by the Complainant some hours after signing it. There was no evidence of pressure. The agency listing agreement was signed by the Complainant after a 24 hour period had elapsed during which the Complainant had reviewed and consider the agreement and the auction as part of Bayleys “Big Call” auction campaign. The licensee presented offers of between $367,000.00 and $405,000.00 and in the words of the Complaints Assessment Committee report were “therefore below the Complainant's price expectations (but) was beyond the control of the Licensee and no fault of the Licensee. The final two complaints were upheld as unsatisfactory conduct and reading the evidence it is clear that the agent failed to act at all times in the best interest of his client, especially considering the age and emotional state of the client. Complaint dismissed based on the due process was followed in the signing of the agency agreement and the professional manner shown by members of the Bayleys team and the auctioneer particularly at the auction. The Agency was though found guilty of unsatisfactory conduct as “on balance, the Committee (took) the view that the Agency had ample evidence of the distress of the Complainant and the actions of the Licensee. In these circumstances the Committee view(ed) that that the Agency should have intervened and properly supervised the Licensee." This brief summary of this case seeks to present a fuller picture surrounding this case rather than the truncated version presented in the headline story. The fact is that the transaction of a property is an emotionally charged undertaking, even more so in the case of an auction. The process needs to be given the care, time and consideration by all concerned - both the agent and client. It is also logical that if the client is elderly and / or emotionally upset that the process should be handled with appropriate care. This was done by Bayleys and their team, however the agent in question did not apply the necessary care, and through the requirement of the oversight, Bayleys are found to be guilty on this matter. This case is being appealed as per the article in the paper - as to the decision of the penalty, as opposed to the determination of the Complaints Assessment Committee. The agent in this complaint Mark Birdling has only this one disciplinary complaint against him. He has been in real estate for over 9 years and has over that time sold many properties for which I am sure there have been many satisfied customers. He has been in my view wrongly singled out for headline-grabbing attention when the other 34 such offences of misconduct or unsatisfactory conduct in 2013 have been largely ignored. Sure the media have a responsibility to report what they see as stories and news of importance to their readers. However you have to seriously ask, is the headline story in today’s paper appropriate to the conduct or is it as so often happens and as I contend, a cheap media grabbing story where the short term profit motives of the media company rides rough-shod over the career and reputation of the real estate agent concerned. Television has long had an affinity with the real estate industry and property - we had the very successful series more than 15 years ago of Location Location Location which shot Michael Boulgaris to prominence and of course more recently Agent Anna. Then of course renovation of property is compulsive viewing with The Block; and from the UK who has not followed the path of Kirsty & Phil in the UK property programme Location Location Location. Property and the transaction of property makes for great TV - great real life drama, a slice of fantasy escapism and human emotions. So it is not surprising that the UK has cooked up a new documentary series following the day to day lives of real estate agents. Aired earlier this month in the UK on BBC2 the first episode of Under Offer is available on You Tube for us kiwi's to watch. I watched this first hour long episode with great interest and found it's excellent real life documentary style very watchable, whether you are in the industry or have a casual interest, because who cannot be interested in the lives of other, especially in such a public industry. The Guardian review was most complementary stating "Under Offer: Estate Agents on the Job could be the most flattering TV portrait of estate agents yet" - I agree, the choice of agents shows a wide diversity and in so doing highlights the very many challenges encountered everyday in the profession. I found it interesting that one of the most retweeted comment behind the hashtag of #UnderOffer was "It pays to have a sense of humour as an agent"
Have a watch and see what you think - share your views and like me await the future episodes to come. Can an agent achieve a higher price than a private sale? This is an age-old question and one that will generate opposing responses based on the perspective of the responder. A few moments spent on the Trade Me forum category of real estate would have you believing that private sales were a viable option and given the projected saving of many tens of thousands of dollars in commission thereby seeing the seller better off than by using an agent; although they would be hard pushed to say that they achieved a higher selling price than an agent. Conversely a conversation with an agent would generate a response reflective of the competitive tension that an agent can generate between competing buyers such that the agent will secure the best price which would be the highest price attainable in the market. The latter caveat being very important. For like it or not, the fact is that there is no evidential way to prove that an agent can secure a higher price than a private seller. The fact is that the price attained for a property is governed by a unique set of circumstances that can never be replicated. There is no such thing as a ‘Control’ in real estate. What I mean by this is that in the scientific faculty everything is evinced by a Control by which any experiment is measured. Testing of drugs, improvements in battery technology, new microchip technology all of which are assessed by a Control that allows scientists to say that this version B is x% better than version A. In real estate this is not possible. No two houses are identical; for whilst they may be two identical apartments or two town houses or even two 3 bedroom family homes in the same street, each will be different as a function of their orientation, conditions or layout. Mix into this the very unique circumstance of the buyer pool that is so small for any property and you begin to realise that every transaction is a very unique set of circumstances that occur at a point in time and can never be replicated. Think for a moment about the sale of a particular property. Could it achieve the same sale price a week later? In theory yes, but the probability is that it would not as the price that was achieved was a function of the buyer pool at that moment in time, a day later, a week later and one or more of those buyers might have exited the market having bought another another house and equally a new buyer or set of buyers might have appeared as they suddenly became ready to make a purchase decision. So unlike the ability to set up an experiment to test price sensitivity for a consumer product in two supermarkets in different areas of the country to test demand the property market does not afford such controls. It is therefore impossible for anyone to say that they could achieve a higher price than anyone else. The price achieved for the sale of a property is a function entirely of two aspects of the property selling process. The ability to achieve maximum exposure of the property for sale within the buyer pool is critical to engage and motivate prospective buyers to review the property. Any lost opportunity in this area is potentially the most damaging to the sale process and impact the sale and the sale price. Exposure is not simply being on the web, it also goes to the presentation of content with particular focus on the images of the property and how they are laid out. The ability to motivate the prospective buyer pool to actively compete to challenge one another to buy the property is key to a successful sale price. This does not assume that the only method of creating competitive tension is an auction although this can be an effective public tool to create emotional tension. A standard well facilitated negotiation between active buyers is just as likely to achieve a favourable result as would a tender. The key to creating competitive tension is the facilitation process which is in someways the greatest skill and attribute of a professional real estate sales person - the ability to maintain buyer interest and bring buyers literally to the table to make an offer and to be motivated to stretch to challenge competing offers so that the final offer meets or exceeds the expectation of the seller. There is no doubt that the component of the property selling process comprising creating maximum exposure has in many ways been taken out of the hands of the real estate agent as the online medium is the aggregation of this exposure through sites like Trade Me Property and Realesatate, however to fully optimise the potential to achieve the best result for the seller the role of the agent is hard to ignore or dismiss as it would take a unique set of skills for a private seller to replicate this capability. Two articles this week prompted my thoughts about the challenge that greater transparency plays in our lives and the impact it will have on the real estate market. I have commented in the past as to the use of obfuscation by some commentators from within the real estate industry when talking about the market, a behaviour that I sense will have no part in the future. The first article that caught my eye was a tweet which came into my stream as a retweet from a person I do not know but the content certainly made me sit up! A person using social media to reach out to as wide a community as possible to ask a question - a very relevant question as to the condition of a rental property. A question they could have asked the letting agent or the landlord, however they chose to reach out to an open audience to see if anyone could answer the question. This 'reaching-out' to people's connections whether on Twitter or on Facebook or any other medium is what the internet allows us all to do. Rather than historically relying on controlled channels we can look for trusted connections to help us evaluate products and services. The lesson for the real estate industry from such examples is be open, be ready to engage and answer all such questions and better still, be proactive and provide as much relevant information as possible. If as the case in this example there really is a water-tightness issue with the property (and I have no idea) then take steps to discuss with the landlord to be ready to answer any such question, after all the agent is just that, the agent, not the owner. The second article was actually a link I saw to a random listing in the US on Zillow. A house that had been on the market for a couple of months. Now; with well over 2 million homes on the market this house is not remarkable in anyway. What is remarkable, and it is not for the first time that I have seen this, but in the context of this issue of greater transparency this property caught my eye because of the richness of valuable information available on the property that we would never see on a property in NZ. Let me highlight these insights and in so doing provide an explanation of why I think we are being short-changed in regard to valuable property information, not so much from the real estate industry but from at heart the property data industry. 1. Sale Price - this property much like most in the US and in fact most countries has an asking price. Not a sticker price, but a price which based on comparable local sales would indicate that it should be worth as judged by the listing agent, thereby providing prospective buyers with a guide. This property may sell for more than the $339,500 if there is sufficient demand just as would be the case for property in Auckland at the moment. To put a price on a property, every property for sale in NZ would not be extra work for real estate agents, it would not diminish their role or devalue the sale price, it would though I think build respect and openness! 2. Last Sale Price - this property sold for $390,000 just over 3 years ago - FACT. A fact that is true of all houses in NZ, yet we are not given open access to this information, it is locked away behind payment walls by government entities (local/ national) - it is public record and should be openly accessible to assist the property process. 3. Days on the market - valuable information, thankfully we do have this insight on both Trade Me Property and Realestate.co.nz in the form of a listed date; although somehow this data structure seems more telling. 4. Estimated valuation - in this case the proprietary Zestimate. A complex dynamic algorithm developed by Zillow to place an up- to-date estimate on every property in the US. Now in NZ you can buy such an estimate from QV for $50, but in the US the data is free, dynamic and referenced as to when it was last updated. QV is joint venture between the Government owned entity Quotable Value Ltd and the US company Core Logic. It's NZ public record data being managed through a US technology company's algorithm to be sold back to us at $50 at a time! It is interesting to see that QV report an accuracy of 10% variance of sale price to estimate 65% of the time and 20% variance of sale price to estimate 93% of the time, Zillow goes further by reporting 5% / 10% and 20% variance by major city with accuracies of up to 73% at 10% variance and 93% for 20%. So the data model of QV is good - we just have to pay the government and the US company for the pleasure. 5. Price History - not only do property buyers in the US have an asking price and a 'last sale' price they also have an incredible insight into the historical price movements of both sale and asking price as cited by this example. Here we can see the historical transaction record (a bleak picture in this case as the US property market tumbled and continues to struggle). Two public record sale prices together with details of when the property was listed at what price and price changes as well as by which agency. I can sense a loud cry from the real estate industry about this data, that it should not be exposed as to do so would be to diminish the appeal of the property. However if all property was laid bare with the true facts, buyer could make informed choices. Property transactions would not collapse. Quite possibly we might not have the rampant property speculation and price bubbles built off the back of sketchy information and hyped frenetic auctions. Maybe, just maybe this greater transparency like sunlight could help us all better understand and operate with greater confidence in the property market! Many years ago, just after I had bought my first house I was visited by a salesperson who on the front door step started to tell me and my wife about the spate of burglaries in the area. The emotion he instilled in us was one of fear. He used approach this to convince us to sign up for a burglar alarm that we could barely afford. This tactic taught me a valuable lesson – be wary of self-interested groups playing on your emotions. The other day a leaflet was dropped into our letter box from a local real estate firm – its emotional message was not couched around fear but around greed! 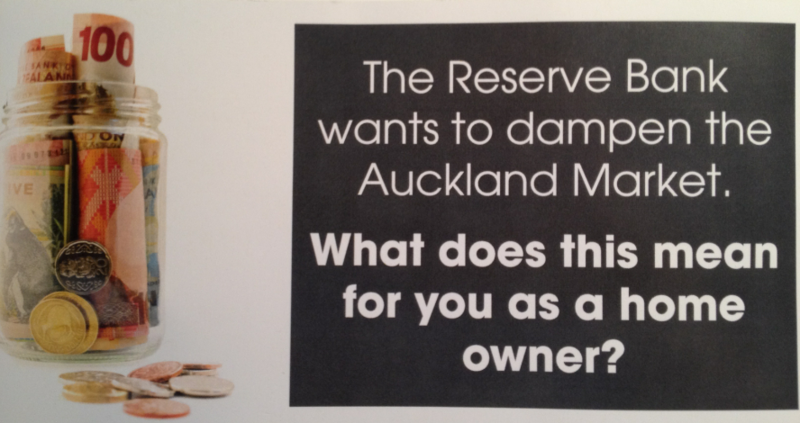 The Reserve Bank wants to dampen the Auckland Market. What does this mean for you as a home owner? Strategically you can use this to your advantage. Consider this… sell now on a higher market with a long settlement, so you are in a position to buy in a lower market next year. If you are considering a move then call us urgently and we will explain how to ride this wave with success. On second thoughts maybe the emotional tactic is two fold – fear at the impending crash, which is likely to follow this action by the Reserve Bank and greed at the opportunity to sell now, buy later ‘short-sell’ tactic. All we need is the herd instinct to complete the three main emotional motivators of stock markets and business behaviour. So here we have a case of future forecasting by local real estate agents. Next year according to them the market is going to be ‘lower’ – the inference being in terms of prices. There is no sound statistics to back this up and therefore there is no basis for a real estate agent to make such an assertion. Selling a service based on possible gain from market movement is neither professional nor ethical. Selling based on emotion is not appropriate. I propose to bring this to the attention of the Real Estate Agents Authority as in my mind it breaches their Code of Conduct 6.4 “A licensee must not mislead a customer or client, nor provide false information, nor withhold information that should by law or in fairness be provided to a customer or client”. Have you like me, been on the receiving end of a telephone call from an agent in the days following an open home? Too often in my experience I find I’m asked to provide what the agent describes as ‘feedback’. This is often couched in terms of "it would be very helpful for the vendor to get some feedback as to your thoughts on the selling price". Whilst somewhat flippant in its tone, there is a serious side to this interchange between agent and prospective buyer. In my judgment feedback is valuable, but only in a subjective sense. It should be of great value for an agent to hear that I judged that the property was ‘bigger / smaller’ than I thought. That it was in a ‘great / dreadful’ location,. That the condition and presentation ‘met / did not meet’ expectation. These and many other similar pieces of feedback would to my mind be valuable pointers for the agent to be able to make suggestions as to other properties that might be of appeal, as well as providing vendor feedback as to how people felt about their property. Why then is there this fixation with agents with trying to get an assessment of the likely selling price from prospective buyers? If, as is the case with most property for sale these days being marketed without a price, does the agent genuinely want you to take a stab in the dark as to a selling price? If the agent has assessed the property at say $590,000 and I say to the agent that I think it is likely to sell for $500,000 at one extreme or $750,000 at the other extreme – the question is, what exactly is the agent going to do with this information? I don’t think they are going to go back to the vendor and say “we had a response from someone at the open home who thinks it will sell for $750,000” nor for the price point of $500,000. After all, the vendor has judged that the agent they appointed to sell their house has the requisite skills to be able to judge the current market price for their property. Let's remember that under the Real Estate Agents Authority code of conduct an agent when taking on a listings agreement with a seller must provide a written Comparative Market Assessment (CMA) for the property. This is detailed in the NZ Residential Property Agents Agreements Guide (download copy). This assessment must use available statistics and market knowledge to come up with a price at which the property should sell in today’s market. This CMA is not a contractual guarantee. Clearly factors outside the control of the agent, may result in the property selling at a level above or below the CMA. Although one would hope that the variance would be small – say within 5 to 10%. I have expressed frustration in the past in regard to the lack of pricing in the advertising of property for sale in NZ, especially the case in Auckland. Every property being marketed by an agent in NZ has a CMA assessment. It is not a registered valuation, but with the skills and requisite data available to all agents it should be the case that a CMA and a registered valuation are pretty close. Given that, and given the fact that valuations are often undertaken by buyers for finance reasons there almost seems a logic in making the CMA a price indicator for property being marketed. Before I get a thousand emails from agents telling me that it is wrong to provide a price indication to buyer, let's be clear here – I am talking of a ‘price indication’, not a ‘retail price’. I am sure it is clear and well understood that a price indication on a property is just that - an indication. The vendor can decide to accept any offer they choose at any price they choose and having a price advertised on a property does not mean that the property can be bought at that price regardless. If there is competitive demand for a property then it could well sell for more than the indicative price if the competing buyers judge that to them, the property represents added value beyond the indicative price. Equally should the obverse occur in such as a situation where there is less demand and thereby the property sells below indicative price. I feel this whole opacity in regard to price indications of property and the desire for feedback does nothing for the industry’s credibility for openness and transparency. I believe it is something that needs more discussion. It all started earlier this year as the active Auckland property market came alive and auctions became the guaranteed process to sell every property or so it seemed. At the same time as buyers became more desperate agents decided to shorten marketing period from the usual 3 to 4 weeks to a matter of 2 to 3 weeks. Then of course we had that much publicised 'Quick flick' auction with a marketing campaign of 33 hours roundly defended by the real estate industry. That the situation raised "significant concerns". "The practice is not one that the authority encourages and one that we would strongly urge any vendor or purchaser to take legal advice about prior to entering into," she said. "From a vendor's perspective, an issue is raised as to whether (they) could receive the best possible result from such a limited marketing campaign. "For any short marketing or sales programme, the vendor should have been given adequate time to ensure they are well informed about the decisions that are being made and the potential consequence of those." I am pleased to see this communicate from the governing body of the industry. They have not made changes the code of conduct but I see this as a valuable communication especially as they make the point that licensees must consider the needs of buyers to ensure they have the appropriate time to undertake due diligence. Too often we only hear the needs of sellers being expressed by agents. The real estate industry keeps telling us that auctions are the best way to sell a property in today’s market. They reiterate that Nationally 20% of properties are sold by auction and in Auckland that number is 40%. Leaving aside whether those numbers are truly reflective of a successful sale at the fall of a hammer at an auction, there is another side to this Pied-Piper-like behaviour by agents to encourage sellers to choose auctions. It is simple and yet not as well reported as the “success rate”. Real Estate agents are being financially incentivised to persuade vendors to go for an auction. I have been provided with information that shows that a real estate agent listing a median priced house in Auckland today could earn an extra $2,000 by gaining the listing as an Auction than as a standard Sale by Negotiation. The extra $2,000 would be in addition to a standard earning of $5,300. That is, in effect a 40% bonus incentive to list a property as an Auction. The sales commission payable by the vendors for a median priced Auckland property today would be $20,528 inc GST based on a $600,000 sale price. It is likely that on average the real estate company will pocket 40% of this commission ($7,140) and then distribute the balance ($10,710) to the agent or agents involved in the successful sale. If the agent who lists the property, also successfully sells the property with no other agents acting for or introducing a buyer then the sole agent will pocket the full $10,710. However, if as does occur especially in larger companies and as a function of the heated property market, buyers are introduced to properties by eager agents, then these agents described as "selling agents" are entitled to a split of the commission with the listing agent. This is where the real estate company leverages that incentive. If you list a property as as a standard 'for sale by negotiation' or as simply a priced property and the subsequent sale involves a separate 'selling agent', then you as the listing agent pick up just 50% of the commission – you take home $5,355, and the selling agent picks up $5,355. If however you persuade the vendor when you list a property to take it to an Auction sale (or a Tender) then you as the listing agent will receive not 50% of the commission but 70% - allowing you to take home $7,497 with the selling agent getting just $3,213. Therefore as an agent listing a property as an Auction in a way secures you a higher guaranteed income than as a standard listing. Now there is nothing wrong, illegal or unprofessional with companies providing sales people with incentives to encourage performance or direct outcomes that suit the company – that is human nature and how commerce works and has done for centuries. However when it comes to selling a home there is a deeper principle of conduct that should be paramount above and beyond the personal financial motivation of agents and their bosses. After all their clients as vendors of houses look to agents to advise them on how to sell as vendors are not that aware of the best approach. That is why the Real Estate Agents Authority, the governing body that oversees, regulates and administers the industry in their latest update to their Code of Conduct specifically included the requirement for agents to disclose to their clients any financial benefit they may receive as a result of a choice in how to sell their house. Before a prospective client signs an agency agreement, the licensee must explain to the prospective client how choices that the prospective client may make about how to sell or otherwise dispose of his or her land or business could impact on the individual benefits that the licensee may receive. Are agents actively informing vendors when they recommend an Auction that they may be receiving a benefit in recommending this approach to selling? – who knows, it is a legal requirement of all agents to make sure they do.